The Dyna-Glo Signature Series DGSS681VCS-D Vertical Smoker is a big-boy that packs a big punch. Featuring a porcelain enameled vertical charcoal chamber, briquettes are kept nicely packed which ensures for better burn efficiency. This is one of the primary features you should really key in on when choosing a smoker. The ash pan can handle a ridiculously large amount of ash which makes for hours of hassle free cooking, and the water bowl does a fantastic job controlling cooking temperatures. One look at the wheels on this smoker and you will see you can roll it literally anywhere. A fantastic option for all smoking aficionados. Getting the Dyna-Glo up and running couldn’t be easier. First up, a simple charcoal fire in the bottom of the smoker, add wood chips (or hickory if you really want to take this to another level), slightly adjust the air inlet to your liking, and then start burning the coals as hot as you desire. The water bowl will keep everything moist and acts as a heat buffer. It literally could not be easier to operate! For its size, the Dyna-Glo Heavy-Duty Vertical Charcoal Smoker is relatively light, of course you wouldn’t think so from a heavy duty steel gauge vertical smoker. 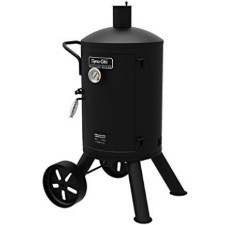 Coming in at just 73 pounds, nobody is saying you can throw this smoker on your back and head out camping. But the steel wheels make it extremely mobile which is what Dyna-Glo had in mind with this specific model. It is designed to move where the party is, and once you get it on its wheels moving it is a snap. The Dyna-Glo Smoker is a heavy-duty performer, a smoker designed for someone who knows what they’re doing and is ready to impress a crowd. At a little over $200 it is obviously an investment, but it won’t break the bank if for some reason you choose to move on to a superior model down the line. A nice addition to any backyard, guaranteed.